In Brief: Walk from Gubeikou to Jinshanling, following stretches of restored and unrestored Great Wall and taking a detour through the pretty farmland that surrounds Hemp Village. Hiking from Gubeikou to the Jinshanling Great Wall. 4–5 hours of hiking over approx. 11-15km. Tomb-Sweeping Holiday hikes—We’re leaving early to get ahead of the holiday traffic, but we still may get stuck in a jam at some stage. Bring a book or something else to keep yourself entertained, just in case! The hike begins at the Gubeikou section of the Great Wall in Miyun County, very close to the border of the Beijing Municipality and Hebei Province. Even though it’s designated as a park, this section of the Great Wall is largely unrestored. It’s not often visited either, probably because it is so far away from central Beijing. 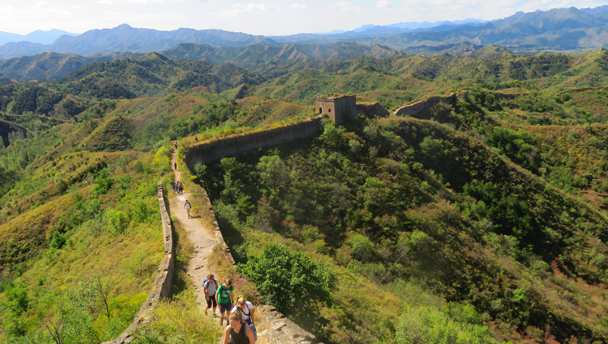 Regular hikers: this is the second-longest version of this route, where we walk all of the Great Wall at Gubeikou and just the first part of Jinshanling. Extremely fit regular hikers: we’ll give you the option to extend the hike! The wall in this area is built on ridges, and because there are not many trees on the ridgelines we will have broad views in every direction as we walk up to the tower in the area. Our path along the wall takes us slowly up to the 24-Eyes Tower, the tallest in the area. It’s named as such because it was built with six windows on each sides. Two sides of the tower have since fallen down, and the rest is being held together by a metal scaffold. From here it’s theoretically possible to follow the wall all the way to Jinshanling, but it’s practically impossible because the wall borders military land and is blocked off. This means taking a detour through Spider Valley! When we first hiked this trail, the bushy path through Spider Valley was draped with cobwebs and we saw many a big fat spider sitting in the middle of their web. These days, there are fewer spiders, and it’s not as scary as it sounds. On the way through the valley, we’ll walk by an abandoned house, wells, and water stores, as well as the occasional cobweb. Before we arrive at the main part of Hemp Village we’ll make a sharp turn and head back up towards the wall, following a trail up the valley. It will take about forty minutes to get up there, and parts of it get a bit steep. Just before the trail gets back near the wall, we’ll run into a newly constructed fence that blocks the regular path. We’ll have to make a diversion down into a valley, passing the house of a local farmer who – coincidentally? – sells cold drinks. From his house we’ll climb up again, reaching our regular path beside the wall and heading on towards Jinshanling. Some of the climbing in this area is a little steep, with some scrambling required. Before we get back on the wall, we’ll pass a spot that offers one of the best views of the Great Wall we’ve seen anywhere, with the whole of Jinshanling spread out across the hills in front. From the photo spot we walk down towards a tower, and on the other side of the tower we’ll find an arch in the wall. We’ll walk through the arch to get back on the Beijing side of the wall, and climb up on to the wall through an old gate. There are a few places where the trail becomes slippery and steep, with gravelly and dusty sections making it slippery underfoot.